Intel is on a downward spiral and it is no secret. Time will tell whether it will take a couple of years or a decade for the profits to turn to losses. However, Intel is in no mood to stay that way. While the era of mobiles have reduced the value of Intel Processors over time, the company is constantly working on finding a footing in the arena. Unfortunately, Intel has yet to make a dent in the mobile segment where ARM is the king and companies like Qualcomm and Samsung have shifted to ARM philosophy. Intel’s mobile processors have been found lacking and with so many companies making processors, it is a hard climb for Intel. Intel Edison seems to skip the smartphones altogether. 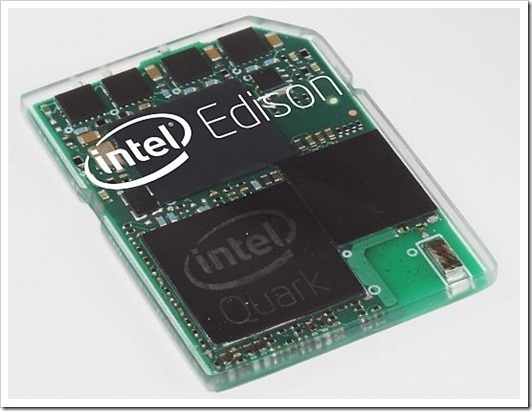 The Quark SOC that was unveiled at IDF is now taking a shape of Intel Edison, a PC the size of an SD card. The biggest point in favor of Intel Edison is that being equipped with Bluetooth and WiFi, this is a full-fledged computer and doesn’t need an outer source for processing- an outer source like a smartphone. This fact spurs imagination to the wildest levels. Until now, most wearable gadgets that are in the market need smartphones in some form or other. However, with Intel Edison, these devices can work independently. Whats more, with Linux installed, Intel Edison has access to its own app store as well! Examples were also shown where this technology can be useful. One device that was shown was a smart watch that did not need a smartphone for tethering. It has geofencing as well which will help track the device. This can be useful for parents with young children. They can track the movement of kids when they go to school and see that the kids are safe. In a country like India where children and women safety are already on edge in the capital itself, this would be a really helpful gadget. Another device was a pair of small earbuds that track heart rate and pulse while playing songs. The data can be sent to a smartphone and as the energy is directly taken from the wearer it doesn’t require battery. In a similar fashion, a device called Smart Turtles with the focus on new parents. It can be clipped to a baby and would monitor the baby’s pulse, breathing and movements. Created by an MIT based firm Rest Devices, it uses an older version of Intel Edison. Besides these examples, Intel has set aside $1.3 million in prizes for people who can come up with innovative uses for Edison. The highest prize on offer is $500,000 and is sure to give us unique devices. Edison will be in market in mid-2014 and it will be very interesting to see how the world takes the product. Intel needs this to succeed as its PC market share is eroding fast. Whatever the case, I am truly excited by what Edison can do and honestly things are getting just started. Can’t imagine how this will evolve in next 5 years or so… What do you think?